C9S2CD4 OK so my random review selector (numbers in envelopes) picks my first compilation CD, and what a compilation. In the past I have bought compilation for two reasons, 1. to get an introduction to a genre and pick the best artists to research more. 2. When a compilation is such high quality it stands up in its own right. This is both and let me tell you why. Firstly if ever see any release on the Soul Jazz Label I would say it's a safe bet that you will get a great compilation, of music covering, soul, funk. jazz, and gospel and most likely it will be worth investing in.Their CDs are beautifully put together, with extensive liner notes, all beautifully packaged. 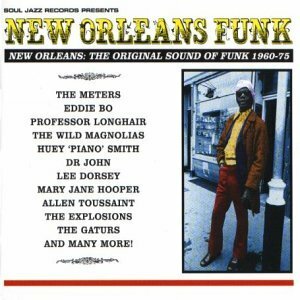 So on to the music, covering New Orleans funk from 1960-75 when I bought this it covered a few artists I knew and loved, The Meters, Aaron and Cyril Neville, Dr John, and Allen Toussaint, but across this CD are 24 tracks of joy, that without compilations like this I wold never be exposed to. As part of this review process I said I committed to listen to each CD twice prior to reviewing it, but truthfully this one hasn't been far from the car stereo all week and I have a multitude of reasons to play it again and again. It seems wrong to single out tracks on this CD as it is complete, and deserves to be played from start to finish and looking back I wish I had picked this as one of my #masterpieces (see previous blog) on Twitter, but hey there is always next time. There was a follow up to this called Friday Saturday Night Fish Fry which is just as good as this compilation so go look them up. If you like soul or funk music or you are good a appreciator of great music go and get this.